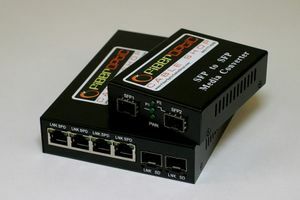 Media converters with two or more SFP connections are very versatile because they allow not only extended distances over fiber, but the fiber type (singlemode, multimode/CWDM) and laser wavelength (850/1300/1310/1550nm, etc.) may be changed to match other cabling or equipment requirements. For example, a singlemode fiber running from building A to building B may be converted to multimode to connect to a multimode fiber running to building C. Likewise, a 850nm (multimode) laser output from building B may be changed to a 1300nm (multimode) laser to match equipment input at building C. Or, if there was only one available fiber in the cable to building D, the signal could be changed to CWDM (wave division multiplexing) to simultaneously both transmit and receive over a single fiber. The capabilities all depend upon the SFP modules you select for these units.